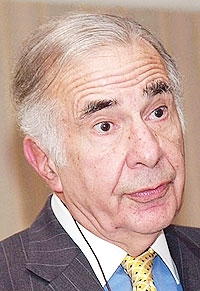 Carl Icahn also controls aftermarket parts manufacturer Federal-Mogul Corp.
NEW YORK -- Carl Icahn's Icahn Enterprises LP offered to buy auto parts retailer Pep Boys-Manny, Moe & Jack in a deal valued at about $863 million. The offer of $15.50 per share in cash represents a slight discount to Friday's close of $15.69. Japanese tire maker Bridgestone Corp. said in October that it would buy Pep Boys for $835 million. "We believe our proposal is clearly superior to the $15.00 per share Bridgestone transaction," Icahn Enterprises' CEO Keith Cozza said in a letter to Pep Boys' management today. The offer includes a potential breakup fee of $35 million, The Wall Street Journal reported. On Friday, Icahn disclosed a new 12.1 percent stake in Pep Boys and said the auto parts and maintenance chain’s retail business should be acquired by Auto Plus -- a competitor he controls. Icahn believes Pep Boys’ “retail automotive parts segment presents an excellent synergistic acquisition opportunity for Auto Plus, a leading automotive aftermarket company wholly owned by” Icahn Enterprises LP, according to a 13D regulatory filing Friday. Representatives for Icahn have “and intend to continue to have” talks with the company and others who “participated in the issuer’s strategic alternatives review process regarding potential transactions involving the issuer’s retail segment,” according to the filing. Icahn may still just be interested in Pep Boys’ retail operation and plan to sell the tire and services division to other interested parties like Bridgestone, said Bret Jordan, an analyst at Jefferies LLC. “I wouldn’t rule out that he owns it ultimately, but I wouldn’t be surprised if he owned it with the intention of auctioning off the service and tire business,” said Jordan, who has a hold recommendation on Pep Boys. Pep Boys earlier today confirmed that it had received notice of Icahn’s investment and said it may threaten shareholders’ ability to benefit from the Bridgestone deal. Pep Boys also identified Icahn as the party that it disclosed in merger documents that had made a $13.50-a-share offer for the company. Icahn on Oct. 22 declined to increase that bid. Icahn's interest in the automotive aftermarket runs deeper: He also holds a dominant 82 percent stake in Federal-Mogul Holdings Corp., which owns about 20 major aftermarket auto parts brands such as Champion Spark Plugs, MOOG steering parts, ANCO wiper blades and Wagner brake parts. Auto Plus is an aftermarket parts supplier that Icahn acquired this year from Canada’s Uni-Select Inc. for about $340 million, and which he is using to drive consolidation in the industry. The company aims to be one of the largest automotive aftermarket companies in the U.S. in the next five years, according to its website. Icahn's Federal-Mogul, meanwhile, in October said it posted a net loss of $52 million on revenue of $5.6 billion during the first nine months of the year -- down from net income of $17 million on revenue of $5.5 billion during the same period last year. The aftermarket business, known as the Motorparts division, said its nine-month operating earnings fell to $152 million from $168 million the year before. It was not immediately clear how much business Federal-Mogul does with Pep Boys and Auto Plus. Pep Boys shares rose 2.3 percent to close at $16.06 today, indicating shareholders were expecting a higher offer. The stock had risen about 29 percent since the Bridgestone deal was announced. Pep Boys had been on the block since June, when it said it was considering selling itself as part of a strategic review. However, in earlier SEC filings, Bridgestone said its management considered a scenario in 2014 whereby it would acquire a few select locations from Pep Boys and partner with a major auto parts retailer to operate the retail segment in each of the locations. This idea progressed to the point where Bridgestone approached Pep Boys in February 2015 about conducting a test run at a few locations, the filing said. Bridgestone singled out markets like Minneapolis, Oklahoma City and El Paso, Texas, for the trials. Unlike rivals AutoZone Inc. and Advance Auto Parts Inc., Pep Boys has not benefited from a resurgent U.S. auto industry due to high costs eating into its earnings and falling sales at its do-it-yourself business. Icahn Enterprises is a publicly traded master-limited partnership that holds stakes in the billionaire activist’s investments in industries including autos, energy, metals, rail cars, casinos, food packaging, real estate and home fashion. Icahn, 79, is worth about $21 billion, according to the Bloomberg Billionaires Index, and primarily invests his own fortune, rather than relying on money from outsiders. Bloomberg, Reuters, Tire Business and Philip Nussel of Automotive News contributed to this report.